User: - Users are the one who really uses the database. Users can be administrator, developer or the end users. Data or Database: - As we discussed already, data is one of the important factor of database. A very huge amount of data will be stored in the database and it forms the main source for all other components to interact with each other. There are two types of data. One is user data. It contains the data which is responsible for the database, i.e. ; based on the requirement, the data will be stored in the various tables of the database in the form of rows and columns. Another data is Metadata. It is known as ‘data about data’, i.e. ; it stores the information like how many tables, their names, how many columns and their names, primary keys, foreign keys etc. basically these metadata will have information about each tables and their constraints in the database. 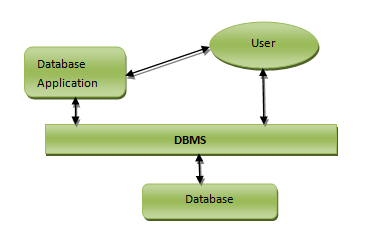 DBMS: - This is the software helps the user to interact with the database. It allows the users to insert, delete, update or retrieve the data. All these operations are handled by query languages like MySQL, Oracle etc. Database Application: - It the application program which helps the users to interact with the database by means of query languages. Database application will not have any idea about the underlying DBMS.